Airport lounges are getting luxe—Delta’s new lounge at DCA, seen here, serves up a menu by a top local chef. Photograph courtesy of Delta. Flying often gets a bad rap. You know the drill: lost luggage, babies wailing, everything Fyre Festival–like in its austerity and discomfort. While some of that does happen, there’s been one upside of airline profits holding steady: Suddenly, airport amenities are getting better, with seats a little plusher, charging stations more abundant, and food and drink choices more closely resembling, well, actual food and drink. Now that terminals aren’t quite as postapocalyptic, private airport lounges have no choice but to up their game, too, says longtime travel-industry analyst Henry Harteveldt. Among Reagan National, Dulles, and BWI, there are 16 lounges, many of which have luxury offerings or are expanding or renovating to provide them. Lounge access is typically available to first- and business-class passengers, frequent fliers, those who pony up for a day pass (often in the $50 range), and holders of certain credit cards. The Virgin Atlantic lounge at Dulles. Photograph courtesy of Virgin Atlantic. So how to lock in the people in the front of the plane? Offer luxe loyalty-program rewards—starting with the lounge. Maybe you want to hang out at the Virgin Atlantic lounge, appropriately Richard Branson–groovy with its mod decor and a cocktail menu curated in part by the mixologists at DC’s Columbia Room. A Grey Goose–and-rosemary cocktail certainly beats the electric-blue margaritas you used to get at an airport Chili’s, no? Chill vibes abound at Dulles’s Turkish Airlines lounge, where a wall of moss and a waterfall transport you to an Enya music video. The space greets guests with Turkish candies at the door and sushi at its buffet. It also features Turkish drinks such as Efes beer at the bar, prayer rooms for passengers, and of course, freshly made baklava. The lounge’s chef trained at the McLean Turkish spot Kazan Restaurant for two weeks to make sure he got the recipe just right. The bar at DCA’s new Delta lounge re­minded me of a speakeasy in Shaw, thanks to a menu that reads like millennial catnip: seasonal cocktails, bourbon flights, sommelier-selected wine, and local beers including Flying Dog, which you can sip while checking out the locally focused artwork. And throw away that slice of Sbarro pizza, you plebeian—chef Marjorie Meek-Bradley of St. Anselm curates the club’s dishes, which in the winter included braised pork shoulder and roasted squash and burrata. Meanwhile, renovations are under way at Dulles’s Air France lounge, while DCA’s American Airlines lounge and Dulles’s Lufthansa and United lounges all have new spaces in the works. When DCA’s terminal expansion is finished in 2021, priority American Airlines passengers may be greeted plane-side by concierges who will drive them to their connecting gates via Cadillac. Post-renovation, Lufthansa will add reclining chairs and quiet spaces to its roster of seated dinners for first-class passengers—who all get a red rose upon boarding. 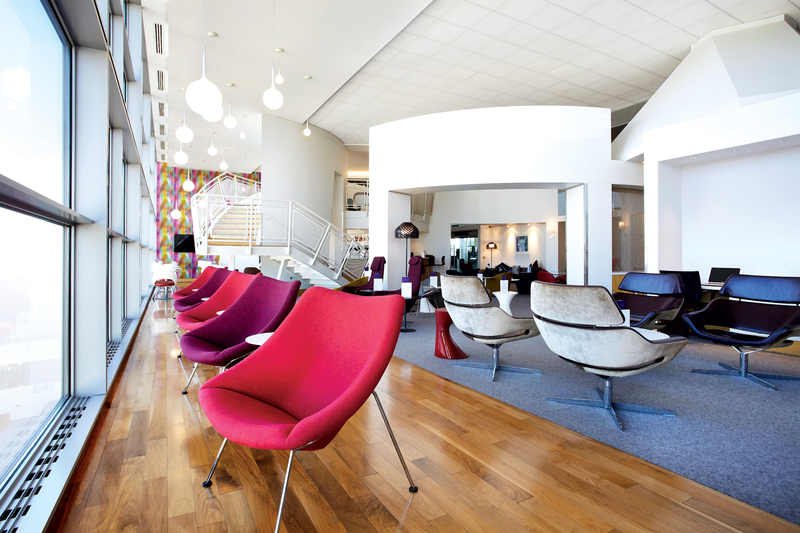 When the updated Air France lounge reopens this spring, it will offer new menus and winetastings. All told, by next year at least ten of the 16 existing area lounges will have been either constructed or renovated in the last seven years. 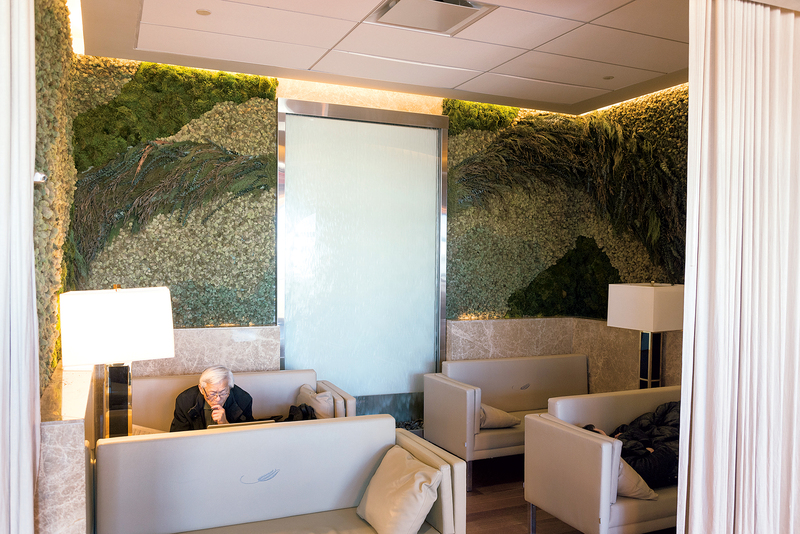 The Turkish Airlines lounge at Dulles features a moss wall and a waterfall, sushi at the buffet, and freshly made baklava. Photograph by Lauren Bulbin. The Metropolitan Washington Airports Authority is reimbursing more than $30 million to United for its forthcoming Polaris lounge, which should open at Dulles by the end of the year. It will be used by United’s premium passengers traveling internationally—who all get reclining seats with Saks Fifth Avenue bedding and noise-reducing headphones in-flight. Expect rest pods with day beds, spa-like showers with bougie toiletries, full-service dining, craft cocktails, and a valet service to press your clothes. While the two lounges at BWI, operated by British Airways and a third-party company, give off more mechanical waiting-room vibes than treat-yourself energy—think bags of chips and premade sandwiches, polyester seats and fluorescent lighting—Club BWI does let you buy a conjoined pass with Roam Fitness, the in-terminal gym where you can also shower and rent or buy Lululemon workout clothes. While these lounges are no private jet services, they’re about as close as you can get without shelling out Jeff Bezos–like money. If today’s terrestrial airline battles are spurring this level of lounge upgrade, think how much more luxurious they’ll get: In 20 years, we’ll all probably be getting in-lounge seaweed wraps before boarding one-way flights to Mars on the Elon Musk.